First, thanks for the High Sierra iso script. You may add "rm /tmp/BaseSystem.dmg" at the end. Then installer requires Internet connection (may be to download the restore image) and the Continue button does nothing. It silently fails (no errors appear). I don't see any option how to configure the Internet connection, neither I want to download anything from Apple. So, I just can't use this iso in VirtualBox. However, I was able to install High Sierra as an update to Sierra. This blog helped me a lot. Edit: Updated for final release. Another way is to use the built-in createinstallmedia tool to install to that blank image, and then convert the image to iso. hdiutil detach "/Volumes/Install macOS High Sierra"
@agentsim, do you have instruction on how to create bootable usb from Linux? @Fiery Is that the Console app running in the background in the screen shot? How did you invoke that? @gerrior It's just the installer's log window. When in Installer, select Log from the Window menu. Well, I've been trying to create a functional bootable installation ISO for High Sierra for like 2 weeks now and I have to say I'm getting sick of doing it over and over again and never getting it to work. I used the original script above and had no success - what I end up with is a 9GB+ ISO file that will boot, yes, but it only boots to the remote disk install method where it has to contact Apple to pull down the installation files every single time and that seems a bit stupid considering they're all right there on the ISO I just created. So, when I saw that newly updated one for the final release posted earlier I fired everything up yet again and gave it another shot and, well, the same results again. I don't particularly know why this is happening, perhaps Apple added some check code in High Sierra so it can detect when it's being used in a virtual machine (I'm using VMware Workstation Pro 12.5, I know that version 14 was just released but I'm not going to touch that right now) and then it just craps out with the remote disk installer instead of accessing the actual files on the ISO. Again it just seems stupid how this is working out but that's what happens I suppose. I still have hope a solution will present itself but, even that updated script that should work for the final release seems like it would but, at least in my usage of it, still just gives me a 9GB+ ISO that can only do the most basic thing which is the remote disk installation method. Sure would be nice to figure this crap out. to the end to get the final ISO conversion done which is followed by just renaming the HighSierra.iso.cdr to HighSierra.iso manually and then deleted the InstallSystem.dmg of course to get that space back. Again, thanks for sharing that solution. Ok, I used those instructions in the post above (halabibk's post) and the first time I did it I got it to work, it installed just fine without a single issue. But then I got stupid and decided to do it again on another drive and the second time it didn't work: the ISO remained bootable, and it did the installation, but the resulting VM wasn't bootable at all. I did some checking and of course even though I had manually chosen to format the virtual hard drive as HFS+ the installer created the APFS container and that borked everything so now I'm attempting to do this in another manner (because that was done using an SSD where the virtual hard drive vmdk file resided). Then manually rename the HighSierra.iso.cdr file to HighSierra.iso. I can confirm the following commands gave me an ISO image that successfully installed High Sierra 10.13 final downloaded from the app store to an Actual, Real Airbook via USB DVD drive, using the APFS container with zero issues. Wifi was disabled before beginning the install. Took a looooooong time to transfer files from the DVD, but it worked 100%. Looks like the APFS issue you mentioned is something in VirtualBox, not something wrong with the image itself. PS - PowerISO said no conversion was necessary when I attempted to use it to convert the DMG to ISO, and the file sizes were identical. when I run the script (edited for the final release) it fails on line 6. Doesn't work for me. The "cp -R /Volumes/highsierra/Packages /Volumes/OS\ X\ Base\ System/System/Installation" part just errors out with 10 different errors, so it's impossible to continue. Easy answer to this: use createinstallmedia from the official image and then rip your USB/DVD device to ISO. Two steps required and it just works. Nice script tho. @agentsum, @satmandu, @umetzu, @vbosx Thank you very much! Everything worked perfectly for me! Be aware that the disk size may have to be adjusted. 5130m didn't work for me, but 5300m did. This worked for me using an increased size for the base image. Thanks to all contributers! pat-s's recipe worked perfectly for me. FS1:> cd "macOS Install Data"
FS1:\macOS Install Data> cd "Locked Files"
FS1:\macOS Install Data\Locked Files> cd "Boot Files"
@stylemessiah, I had the same issue. I wasn't able to quickly find a reasonable explanation/fix. Instead I created dmg using disk utility (File -> New Image -> Blank Image, Size 6000 Mb, Format Mac OS Extended Journaled, Single partition - GUID Partition Map, read/write) and it worked just fine. On MacOS 10.13.3: mwiesen's script in the prior comment still works. FWIW, I couldn't get that script to work on a prior beta of High Sierra but using production 10.13.2 worked - call to createinstallmedia failed. @mwiesen Did also worked for me. Thanks a lot for sharing. Also be sure that the whole /Applications/Install\ macOS\ High\ Sierra.app is downloaded. The first time I tried to download High Sierre the App only was about 50 MB big, only contained the installer for upgrading on the fly not the whole High Sierra Image. Should be around 5 GB big. And got a bunch of errors on the line cp -R /Volumes/highsierra/Packages /Volumes/OS\ X\ Base\ System/System/Installation. But nevertheless I continued and it seemed to work fine. Finally an .iso was created on my Desktop. However, when I tried using it to install it in VirtualBox (Version 5.2.6 r120293 (Qt5.6.3) it seems to get stuck, as shown in the image forever. Any suggestions guys ? To continue we need to erase the volume at /Volumes/install_build. I'm trying to run this on 10.12.6 (Sierra). I haven't run the upgrade yet. The download in /Applications/Install macOS High Sierra.app looks ok, it is 4.9 GB, (4,968 MB). If I run createinstallmedia using a physical 8 GB USB thumb drive it succeeds. @stylemessiah - were you able to figure it out? Any ideas from anyone welcome. @rct It is caused by permission mismatch. Remember, if you use 'sudo' you are executing the command as a root user, therefore created file will be owned by root. Solution is to be consistent with sudo. If you create file as a root, mount it as a root. If you create it as normal user, mount it as normal user. I got the same error that mentioned by @stylemessiah and @rct. I retried the same instructions after increased the size of image from 7136m to 8000m. It worked for me. Made a fork of this code. If you use it, edit the VARIABLES section to meet your needs. I sorted them in order of what I thought might most likely need editing for your environment. Happy Independence Day, USA people! As of today, I was able to a successfully boot and launch the High Sierra installer from an ISO image that I converted from the High Sierra 10.13.6 installer that I downloaded from the Apple Store (converted using Pat's Nov. 2017 instructions above). 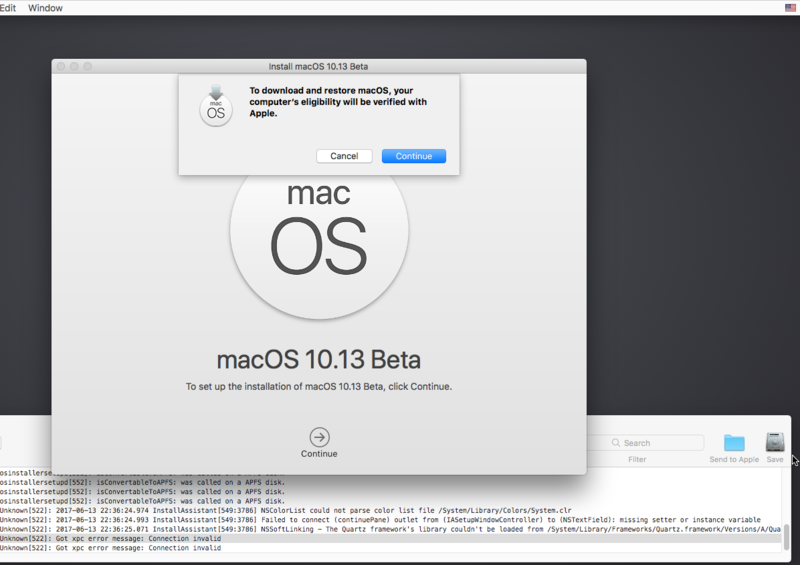 The installer is running in a Virtual Machine (guest) under VirtualBox 5.2.19, running on a Late 2015 iMac (Retina) host. Additionally, from the command line had to create the following Virtual Box extra data values for the VM. NOTE: These seemed to be critical for me to get the installer to boot and run. These extra data settings I found to be omitted from most or all of the Mac installation instructions that I found online. I borrowed these values from Windows VirtualBox install instructions, and modified the system product to match my iMac's (iMac17,1). Without these extra data settings, the installer failed mid-boot, infinitely looping with some error pertaining to trying to reboot MACH). 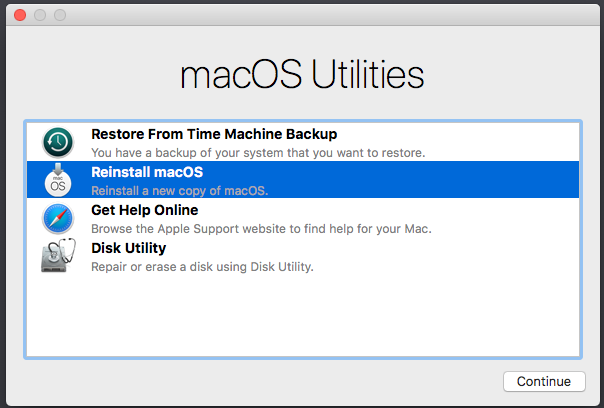 Finally, when the installer came up, before attempting to install, I had to select Disk Utility from the list, and find and format (e.g. Erase), the VDI disk I created (the hard disk shown on the left) as Mac OS Extended Journaled. Without first formatting the disk, the installer found no disks upon which it could install macOS, and was a dead end. For anyone wondering if it is possible to install this ISO into VMware Workstation under a Windows machine, follow this: https://github.com/DrDonk/unlocker . Note: it may give you an error like VMware Workstation unrecoverable error: (vcpu-0) simply edit your .vmx file and add smc.version = "0". Looks like Apple places a link on /Volumes/OS\ X\ Base\ System/System/Installation/Packages. In order to copy the required packages, we need to remove the link and then recreate the folder. I tested the final image and everything works fine.